World clean energy investment totalled $333.5 billion last year, up 3% from 2016 and the second highest annual figure ever, taking cumulative investment since 2010 to $2.5 trillion. London and New York, January 16, 2018 – An extraordinary boom in photovoltaic installations made 2017 a record year for China’s investment in clean energy. This over-shadowed changes elsewhere, including jumps in investment in Australia and Mexico, and declines in Japan, the U.K. and Germany. Solar investment globally amounted to $160.8 billion in 2017, up 18% on the previous year despite these cost reductions. Just over half of that world total, or $86.5 billion, was spent in China. This was 58% higher than in 2016, with an estimated 53GW of PV capacity installed – up from 30GW in 2016. Justin Wu, head of Asia-Pacific for BNEF, said: “China installed about 20GW more solar capacity in 2017 than we forecast. This happened for two main reasons: first, despite a growing subsidy burden and worsening power curtailment, China’s regulators, under pressure from the industry, were slow to curb build of utility-scale projects outside allocated government quotas. Developers of these projects are assuming they will be allocated subsidy in future years. Solar led the way, as mentioned above, attracting $160.8 billion – equivalent to 48% of the global total for all of clean energy investment. The two biggest solar projects of all to get the go-ahead last year were both in the United Arab Emirates: the 1.2GW Marubeni JinkoSolar and Adwea Sweihan plant, at $899 million, and the 800MW Sheikh Mohammed Bin Rashid Al Maktoum III installation, at an estimated $968 million. Wind was the second-biggest sector for investment in 2017, at $107.2 billion. This was down 12% on 2016 levels, but there were record-breaking projects financed both onshore and offshore. Onshore, American Electric Power said it would back the 2GW Oklahoma Wind Catcher project in the U.S., at $2.9 billion excluding transmission. Offshore, Ørsted said it had reached ‘final investment decision’ on the 1.4GW Hornsea 2 project in the U.K. North Sea, at an estimated $4.8 billion. There were also 13 Chinese offshore wind projects financed last year, with total capacity of 3.7GW, and estimated investment of $10.8 billion. BNEF’s preliminary estimates are that a record 160GW of clean energy generating capacity (excluding large hydro) were commissioned in 2017, with solar providing 98GW of that, wind 56GW, biomass and waste-to-energy 3GW, small hydro 2.7GW, geothermal 700MW and marine less than 10MW. Breaking the investment total down by type of deal, the dominant category – as always – was asset finance of utility-scale renewable energy projects of more than 1MW. This was $216.1 billion in 2017, up fractionally on the previous year. Small-scale projects of less than 1MW (effectively small solar systems) attracted $49.4 billion, up 15% – thanks in large part to the installation rush in China. Source: Bloomberg New Energy Finance. Note: Clean energy covers renewable energy excluding large hydro, plus energy smart technologies such as efficiency, demad response, storage and electric vehicles. BNEF’s annual figures for past years, revised in this round, are $61.7 billion in 2004, $88 billion in 2005, $129.8 billion in 2006, $182.2 billion in 2007, $205.2 billion in 2008, $206.8 billion in 2009, $276.1 billion in 2010, $324 billion in 2011, $290.7 billion in 2012, $268.6 billion in 2013, $321.3 billion in 2014, $360.3 billion in 2015, $324.6 billion in 2016 and $333.5 billion in 2017. The above figures all concern new investment coming into the clean energy sector. BNEF also measures money changing hands, as organizations purchase and sell clean energy projects and companies, and refinance existing project debt. This acquisition activity totaled $127.9 billion in 2017, up 4% on the previous year and the highest ever. Acquisitions and refinancing of renewable energy projects rose 14% to a record $87.2 billion, while corporate M&A involving specialist clean energy companies fell 51% to $17.5 billion. Public market investor exits came to $7.4 billion, down 8%, and private equity buy-outs reached an all-time high of $15.8 billion, up sixfold on the previous year. The largest acquisition transaction of the year was the purchase of a 51% stake in U.S. ‘yieldco’ TerraForm Power by Brookfield Asset Management for $4.7 billion. 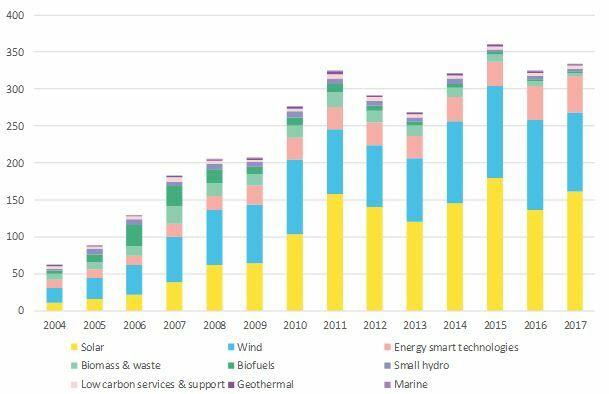 More information on BNEF’s 2017 clean energy investment trends can be found here: https://about.bnef.com/clean-energy-investment/. Today’s press release is being published in tandem with a comment article setting out BNEF’s 10 Predictions for Energy in 2018, based on the views of its analyst teams on everything from wind and solar, to storage and electric vehicles, from U.S. policy to advanced mobility. See this link.